Father’s Day is a day to celebrate fathers, grandfathers, and fatherhood in general. It’s most commonly celebrated in March, April or June. If you are from the US or maybe the UK or France, it falls on June 17. In Estonia, where Ganttic is based, Father’s Day or ‘Isadepäev’ is celebrated on the second Sunday of November. Whatever the date, we can all agree it’s a Day worth using the capital D for. Your kids are probably googling the best Father’s Day gifts on the budget and how to make Father’s Day cards. Your wife is trying to remember the pound cake recipe or how to make that cheesecake that you loved so much. They might be organizing a BBQ for your honor since they know how much you enjoy standing next to that grill. That’s them trying to figure out how to make Father’s Day special for you. Although, if you really want it to be a special day, you got to step it up. They can make the pound cake but you must be ready to eat it. Taking a day off isn’t the easiest task. It can be easy to plan it, you can just drag and drop an event or mark your day as busy but that’s not all there is and you know it. It has to be that mindful kind of a day off. A day that you are consciously taking off. Notify others that depend on you that you won’t be available. The world won't stop if you take a day off. Things will happen. But it doesn't matter. You can still take the day off. If you usually plan the tasks for the week ahead on Sundays, you are going to have to do it on the Friday or Saturday. That goes with any other responsibility or task that you'd normally do on a Sunday. The tasks you have can either wait or you can do them beforehand. Don’t make exceptions. Take time to let go of the idea that you can peacefully watch TV or visit the gym. Yes, it’s a day for you. No, you shouldn’t spend it alone. Practice the surprised face if that’s not something you are good at. Don’t expect anything. Be happy about everything you get. Since you already prepared yourself, being present shouldn’t be too difficult. Above all, you should aim to have a good time and bond with your family. Keep that in mind at all times. Turn off your phone or at least mute the notifications. Notifications are a slippery slope. One minute you are just scrolling through them. Another minute you’ll find yourself lost in the depths of your mailbox. Enjoy the crafts and gifts. Really enjoy them. Imagine how your wife made your toddler to make a ribbon-shaped pizza for you. Imagine your kids picking out a hideous tie for you or making a tie-shaped gift box. That’s hilarious and precious at the same time. Actively think about being present. You know you planned everything out. You know you can afford to take a day off. Wiggle your toes to bring yourself back to the moment. If your family has a plan set in stone, go with it. Let them take the wheel. If you feel even a half of a thought coming to your mind in the lines of how it’s not what you expected or how you could be doing something useful, let it go. If you are not sure how to do that, go back to the previous tip. However, if they don’t have everything figured out, have something in the back of your mind that you’d like to do. It can be tricky to figure out what the other person would enjoy. 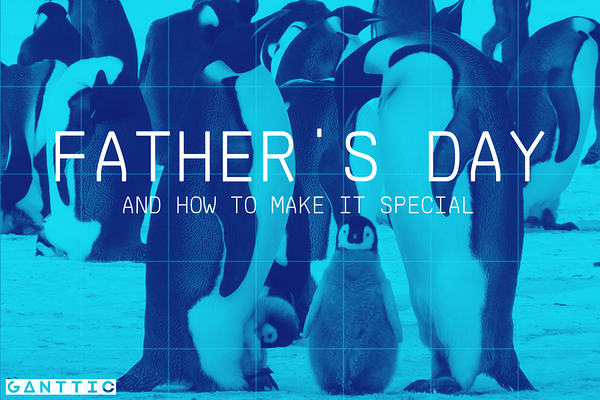 It’s can also be tricky to figure out how to celebrate Father’s Day. Meet your family halfway. Whatever it is, remember that the day should be about being together and doing things as a team. Go hiking even if it’s something you never do. Pick a trail that’s suitable for the little ones and pack a lunch. Since it’s spur of the moment, don’t worry too much about the details. However, do make sure that the pound cake is in the picnic basket. If hiking is too much, go for a walk and sit down at the local park. Go fishing. Make a fishing rod out of a branch if you don’t have one. Find a YouTube tutorial if you don’t know how to. Make it into a fun project. Double check if you packed the cake. Stay at home and let them show you things that they enjoy. Even if the things they enjoy are memes or Youtubers. Eat the cake if it all gets too difficult to comprehend. Go to an amusement park and find the rides that make you the least nauseous. Throw tarts and try to win that pink elephant. Try to impress your family as if you were a teenager and they were that really pretty girl you like. Keep in mind that you probably can’t take the cake with you if you decide to go with this option. Visit your dad. Take the cake with you. Nothing else to say here. Tell stories and just talk while doing whatever it is you chose to do. Stories about how you used to spend Father’s Days with your dad. Stories about your childhood or a funny thing that happened last week. Storytelling is one of the oldest ways to bond and share knowledge. And you must admit that it’s kind of sweet that your children are forced to take in your wisdom. Even more so if they are teenagers. Sometimes there really isn’t a way to take the day off. That’s okay too if you take a raincheck. You could say to yourself that it doesn’t matter and you can be with your family any other day. But will you really? Father’s Day is a good excuse to squeeze in some of that much-needed quality time. Don’t let that excuse go. It’s not that you really need it or can’t spend time with your family otherwise. It’s just… Take a raincheck and follow through. Look at your busy schedule and find the next day that you can take off. Don’t find excuses, find a day. You are good at planning time at work. Apply some of those principles here. Consult with your family to see if the day you have chosen suits them as well. Book it. Prepare for it, be present, and surprise yourself. If you are the go with the flow kind of guy, just go with the flow. Enjoy your day as you would. Eat the cake. Read the card. But, you know, it’s still a good idea to take the most out of the day. So think about it. Okay?